I finally founded the first commission that I did. It was hidden well! These dogs were fun to draw and had very different personalities. The dog with the paw print was posthumous. But the customer was very happy and displayed lots of tears too. I love the way the little Yorkie in the top right has his ear sticking straight out. 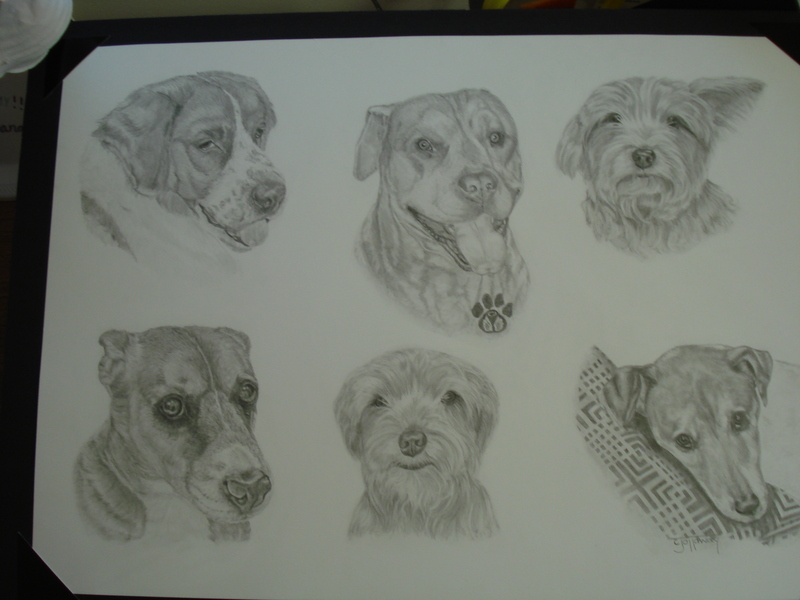 David liked the Yorkie in the middle and said, “that he’s trouble.” The Boxer mix in the bottom left had his ear been bitten off by the dog in the middle (poor thing)….but out of all of it, the hardest thing to draw was the pillow that the Jack Russell was laying on…oh my goodness that had me sweating! I’ve typed before and I’ll type it again…I need to start drawing backgrounds! As far as recent work, I’ve been working on another weathered barn front and I’m gathering materials for a collage that I’m making for David. The collage’s premise is Electrical engineering…. parts, schematics, cords and hopefully a machine or too. I might do this as W.I.P. and if it works out I will post the results. Welp, I guess that’s about it for me.